SEATTLE – The “Minecraft: Story Mode” game review station at the Pax Prime convention was seriously impressive. Walking into a giant square room via a hallway designed as if it was right out of “Minecraft,” I couldn’t help but get excited to review the game itself, but will it be worth purchasing? 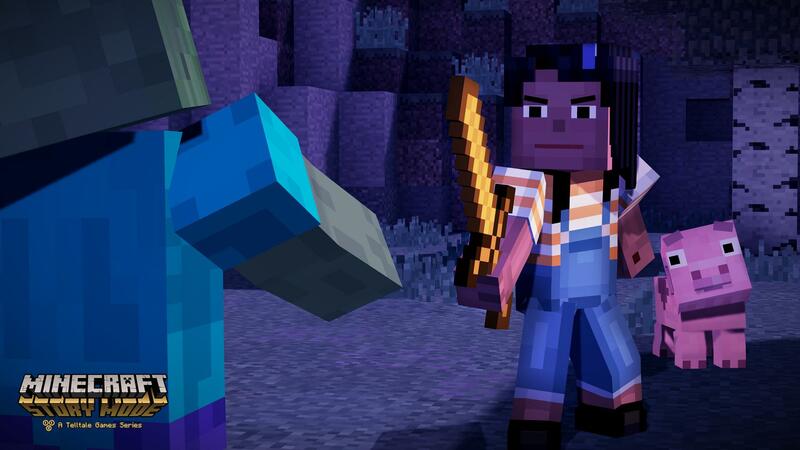 “Minecraft: Story Mode” is set to be released by the end of the year -- a date has not yet been announced -- and the demo being shown at Pax was episode one out of the five-part series. Please note there are spoilers ahead. The basic premise, and what sets it apart from the regular “Minecraft” game, is that this one is narrative-driven. You play as the protagonist Jesse (whose looks you can customize), on a quest with his friends to find the four members of the Order of the Stone, to “save their world from oblivion,” according to the game's developer. The game is made in developer and publisher Telltale Games’ familiar style. It is essentially an interactive movie, with players able to steer the storyline through a decision-making mechanic at certain points in the gameplay. Part one sees Jesse’s pet pig Reuben run away into the woods -- you have to find him. As you wander around objects that you can interact with and movement instructions pop up on screen, miss one and you could be dead -- therefore you always have to be paying attention. Once you find Reuben, hidden in some tall grass, a whole bunch of zombies pop up out of nowhere. Reuben gets scared and you have the option to tell Reuben what to do -- the option that I picked resulted in a zombie giving Reuben a black eye, the poor pig looked so sad it was heartbreaking. Fighting off the zombies with your sword (which you’ve had since the beginning but haven’t had to use until now) results in it self-destructing after a little while. This presents a problem, as you are defenseless in a big scary world. Luckily, your friend Petra takes you into a building to design a new sword of your own. It is here where the little sparks of humor throughout the narrative became evident, which makes for an amusing time. “Isn’t it better when you make it yourself?” says Petra once you’ve completed the sword. “It’s a sword, not a sandwich,” says Jesse. That is essentially the end of part one. In the second scene you see a giant alien-like creature with three heads and laser tractor beams for eyes come up out of the ground. While running away from the monster Petra almost gets sucked up by one of the tractor beams, so you have to try to save her and then continue running while dodging tentacles that pop up out of the ground. Failing to dodge them or hitting them with your sword when prompted leads you to die. Eventually you end up in another building, where you meet a man that prompts the start of episode two. That was the end of the demo for me. One of the biggest things I noticed while playing “Minecraft: Story Mode” was just how dark the overall tone of the game was. I was not expecting that from a “Minecraft” game, even a narrative-style spinoff (the game has not yet been rated). Overall, playing through the first episode was interesting, purely because it was cool to see a “Minecraft” game with a storyline, and figure out the gameplay style. Personally, I found the quicktime style of interactive movie distracting, I like playing games because they are games and the number of options are often more broad. It is definitely not the sort of game I would normally play, and I honestly don’t think I’ll be picking up a copy for myself. But fans of the quicktime style of game, and “Minecraft” will most likely enjoy playing. 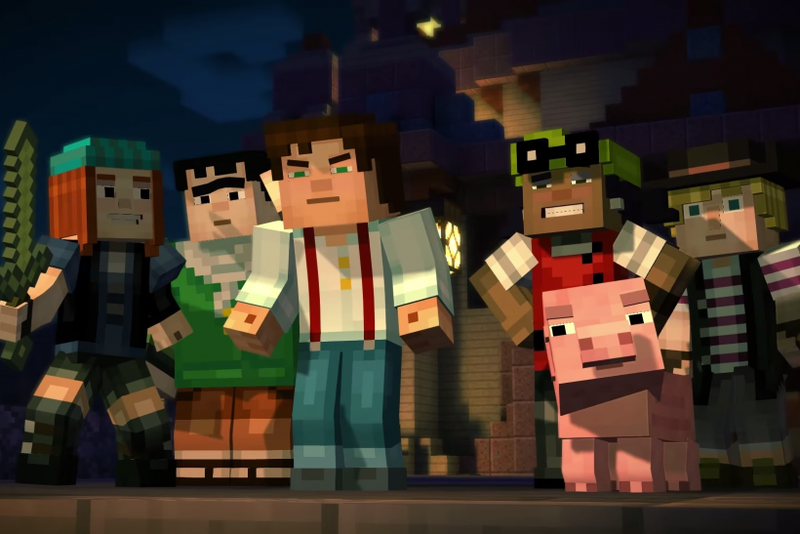 “Minecraft: Story Mode” will be available on PC, Mac, PlayStation 4, PlayStation 3, Xbox One, Xbox 360, and compatible iOS and Android-based devices.